Last night I watched a documentary called The Great Hip Hop Hoax. It opened up so many themes and questions I just had to write about it. I was attracted to it because a) it popped up in the iTunes gallery of Indie films to rent (not exactly hard work on a Friday night) and b) I LOVE hip hop, so it’s no surprise that it piqued my interest. I’ve been a hip hop fan since my early teens and that relationship has only grown as I’ve got older. Common, Skinnyman, Drake, Kanye West, Talib Kweli, Pusha T, Wretch 32, Dan Le Sac Vs. Scroobius Pip are just some of a long list of artists I admire. It’s quite a big part of my life, so I was interested to know what this documentary had to say. I was surprised to find that it had so much more to discuss than ‘just’ music (that, of course, wouldn’t have been a problem). There was far more, and it had me hooked. The tale begins with two outgoing Dundee college boys who are the very best of friends – Billy Boyd and Gavin Bain. They hang out, go to ALL the parties, drink a lot, and while doing this they discover that they are both pretty bloody good at rapping and producing – and so a beautiful musical friendship ensues. While casually surfing the internet one day they see a pop-up ad asking for ‘the next Eminem’. They respond to this, and soon find themselves on a 13-hour coach down to London for an audition. However they are laughed at by some record label suits who find the idea of a Scottish rap-duo far too ridiculous, and label them ‘the rapping Proclaimers’. This doesn’t go down well and they get back on the coach, describing themselves as ‘heartbroken’. I’m sure we can all relate to that sting, the shock when you are misunderstood, or what you are trying to achieve is misinterpreted by people who matter – I don’t know about you, but I’m guessing that most of us probably weren’t trying to break into the rap world! So anyway, when they get home they don’t give up. They keep calling labels and there’s no interest, until one day they put on an American accent, just for fun. It’s a spur of the moment decision that changes the course of their lives. They tell the label they call that they are from California, and suddenly there is a shred of interest. What happens next is beyond wildest dreams. They make themselves American, changing their hair and clothing style, studying the accent and devising a whole back story. Their cleverly constructed songs (likened to The Beastie Boys) are re-recorded with an American accent and they dedicate themselves to this as if their lives depend on it. And bam, they get a big fat record deal with Sony and are thrust into the spotlight. I won’t give too much away beyond this point because I feel that the magic of this documentary lies in the tension throughout. You start to feel nervous for them. Will they get busted? Will one of them slip up in an interview, or even live on stage? Is their back story watertight? What the flippedy hell are they even doing anyway?! There’s humour to be found in scenes at The Brits and in warm-ups with D12, and sadness too, when you see them getting deeper into their own lies at the cost of their health and relationships with not just loved ones, but each other. This film highlights the notion that some major companies have such a fixed idea of what they are looking for that they miss real talent hiding in other places. 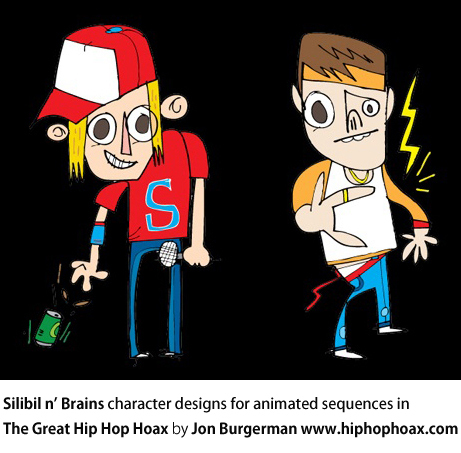 Silibil n’ Brains are clearly very talented rappers, but yet they weren’t given the time of day until they adopted a totally different persona. Essentially the minds behind the music were still there – albeit in disguise. Then there’s fame and the hunger that goes with it. So many people in modern society want fame so much that they would do anything. This brilliant documentary shines a bright light on this and shows the true cost too. But above all this, is the theme of lying. How much lying is acceptable? Is it ever ok to lie? Would you change your whole identity if it meant achieving a long-yearned for dream? The Great Hip Hop Hoax has all the ingredients for a great film. There’s tension, humour, sadness and it stays with you in that way that only brilliantly constructed documentaries do. And just to add a little more magic, scenes are interspersed with beautiful animations (see below) by award-winning artist Jon Burgerman and Bafta award-winning animators Will Anderson and Ainslie Henderson, which makes it even more of a pleasure to watch. This entry was posted in Home and tagged documentary, hip hop, identity, lies, music, music industry, the great hip hop hoax, vertigo films by jessicathompsonbooks. Bookmark the permalink.